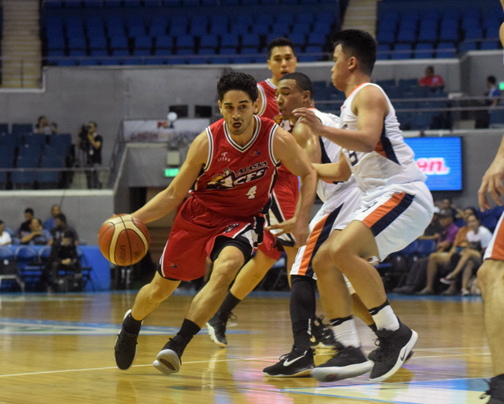 Fighting with desperation, Alaska was finally able to shake off the cobwebs and rout Meralco, 92-77, to snap its three-game slump and pump life in its campaign in the 2019 Philippine Basketball Association Philippine Cup at the Smart Araneta Coliseum last night. Alaska’s potent backcourt and wings came to work and took care of business as the Aces faced a must-win situation. Jeron Teng led the way for Alaska, tallying a team-high 16 points with seven rebounds while Simon Enciso tallied 14 and Chris Banchero had a double-double, registering 13 points and 11 rebounds across his name. Sonny Thoss almost had the same feat, scoring 13 markers as well on top of eight rebounds even as Jvee Casio added 12 more points. It was a huge victory for the Aces as they improved to 4-5 to earn a sixth-place tie with NLEX. With two games left, they now have a fair chance to stay in the top eight and earn a berth in the quarterfinals. As for the Bolts, this second straight setback was costly. They fell to 3-7, still in 10th place, and their fate is no longer in their hands anymore, having a very slim chance of making it in the top eight. The Aces started gaining some ground after a 17-8 run to end the first half, taking a 45-38 advantage in the process at the turn. With momentum on their side, they resumed their surge in the third, manufacturing a 15-2 blitz to stretch their lead to double-digits, 58-43, after a Noy Baclao lay-up at the 5:42 mark of the quarter. From there, the Aces showed no letdown as they closed out with a bang in the fourth, posting a huge lead in the final tally. Nico Salva led the heartbroken Bolts with a game-high 23 points. In another equally important tiff, Magnolia (3-5) and NorthPort (3-5) are fighting for their lives as well against each other, as of this report.